There is something so comforting about a big bowl of pasta. Maybe it’s because I grew up eating pasta at least once a week, probably more. I remember my mom would set two candles on the table on pasta nights. Now that I think about it, I should do the same for my family on pasta nights—reinstate the tradition. 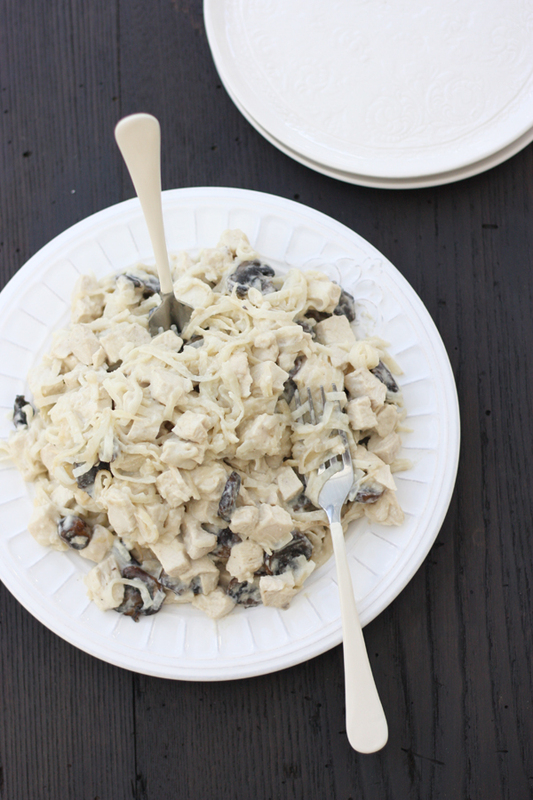 This Chicken & Mushroom Alfredo reminds me of chicken noodle soup. That chicken noodle soup flavor comes from the celery root, or celeriac, which has a mild celery taste. While I love to spiralize sweet potatoes, zucchini, and parsnips; spiralized celeriac is our favorite. This recipe comes from my free ebook, which contains ten healthy, delicious pasta recipes. Some of my other reader favorites from the ebook include Lasagna, Chicken Matriciana Pasta, Nutty Szechuan Noodles, and Taco Hamburger Helper—all of which are grain-free and dairy-free. Read more about our story in my bio and under the label, Recovering Ashley. This guest recipe, post, and photographs are from Kelly at The Spunky Coconut. Peel the celeriac with a knife, then spiralize them. Sprinkle ¼ teaspoon of sea salt on each spiralized celery root. Place a 12 inch pan over medium heat. Add a tablespoon of ghee and the celery root noodles. Sauté the noodles, stirring frequently, until they have reduced by about half. Use a blender to puree the sauce, and pour it over the noodles. Put the lid on, slightly cracked, and simmer over almost low heat for about 20 minutes. Meanwhile sauté the mushrooms in a separate pan. Heat the pan over medium heat, then add the ghee, mushrooms and a pinch of salt. Sauté until the mushrooms are tender, then set aside. While the noodles are simmering in the sauce make the chicken: Add the ghee to a pan over medium heat. Sprinkle the chicken with salt, onion and garlic powder on both sides. Place the chicken in the pan and cook for about one minute. Flip the chicken over, add the water, and put the lid on, slightly cracked. Reduce the heat to low, and cook the chicken until it’s done (about 20 minutes). Let the chicken cool, then chop it into bite-sized pieces. Add the chicken and the mushrooms to the noodles and sauce. Stir to combine, then serve with fresh cracked pepper. what do you mean when you say : spiralize the celeriac?? Which tool do you use? I think she means to use a spiralizer. Like this one. I just found your blog and all of the recipes you have on here look amazing (and actually doable, which is a huge plus for me)! I can’t wait to try this one and many others. Nutrition breakdown? How many sevings? I give it 5 stars for creativity. This looks fantastic. 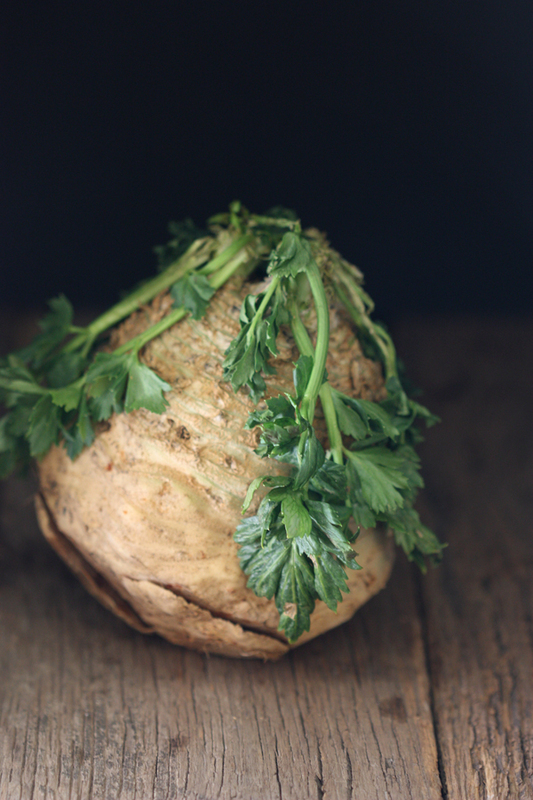 I’ve never known what to do with a celeriac root. Can’t wait to try. I think I’m going to try doing a celeriac root carbonara too.